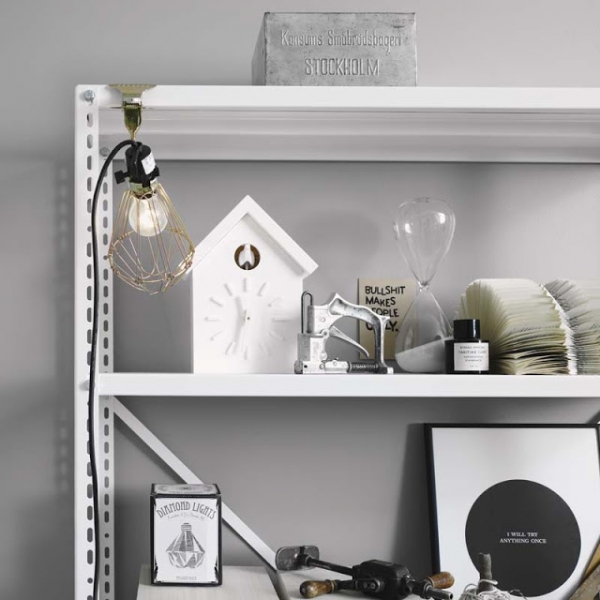 Stylist Lotta Agaton worked with Swedish company Folkhem on this stunning grey color scheme. It is fabulously executed, with touches of black and white, adding a bit of contrast to the design, and a touch of color, bringing some variety to this gorgeous space. 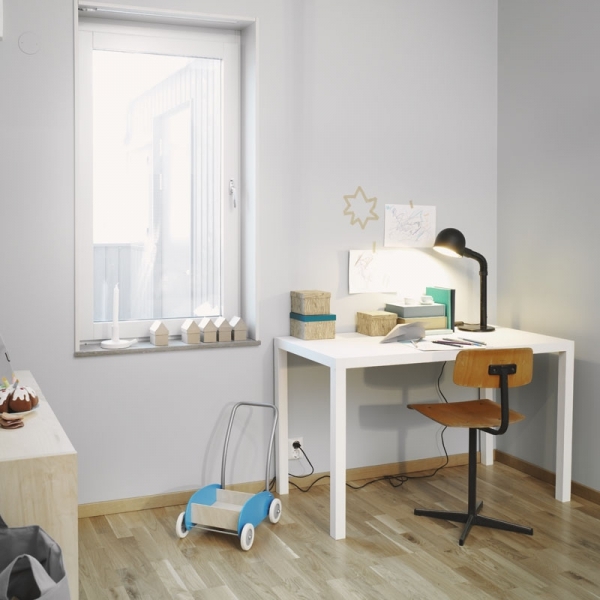 The living room has large windows, allowing natural light to brighten up the space, and light grey walls set the tone for this wonderful color scheme. The hardwoods are lovely, adding warmth to the design, and a grey area rug brings texture to the room. A black sofa filled with fantastic accent pillows sits against the wall, and a sleek black chair with an awesome subtle pattern sits near the window. 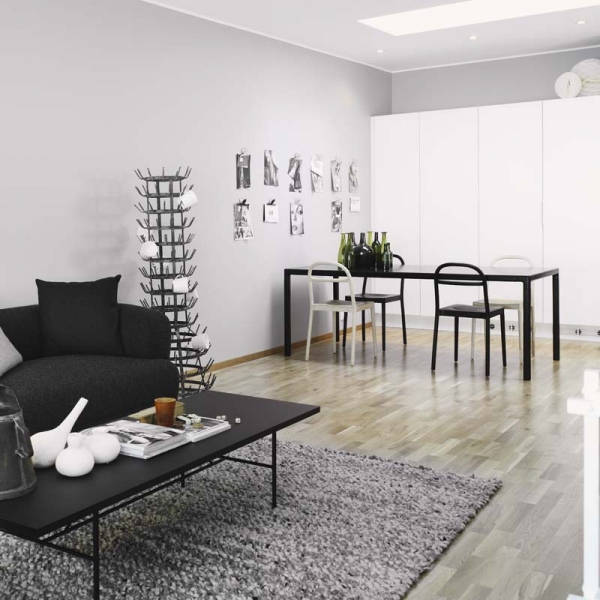 The décor in this area is delightful, it is marvelously balanced, perfectly complementing the grey color scheme. In the dining area, a black wooden table is surrounded by a mix of light and dark chairs. 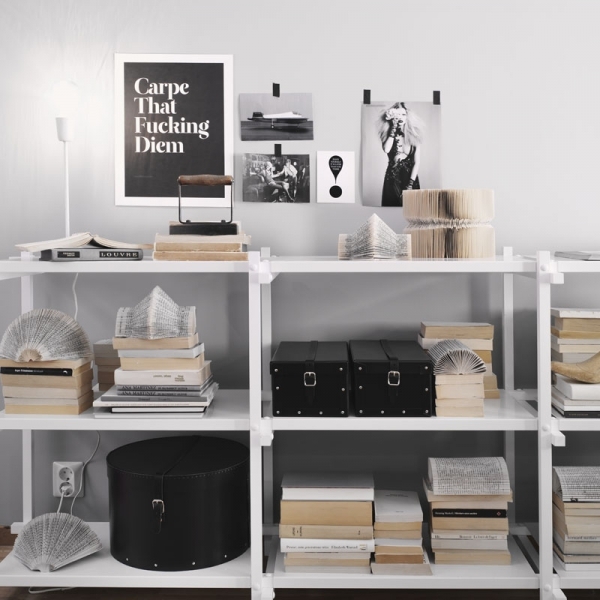 Photographs and magazines decorate the wall, bringing a casual feel to the design. The green bottles are such a wonderful choice, and their placement is interesting and exciting. The bedroom and bathroom are our favorite places in this stunning home. In the bedroom, the platform bed is adorned with quilted bedding, adding so much interest to the design. 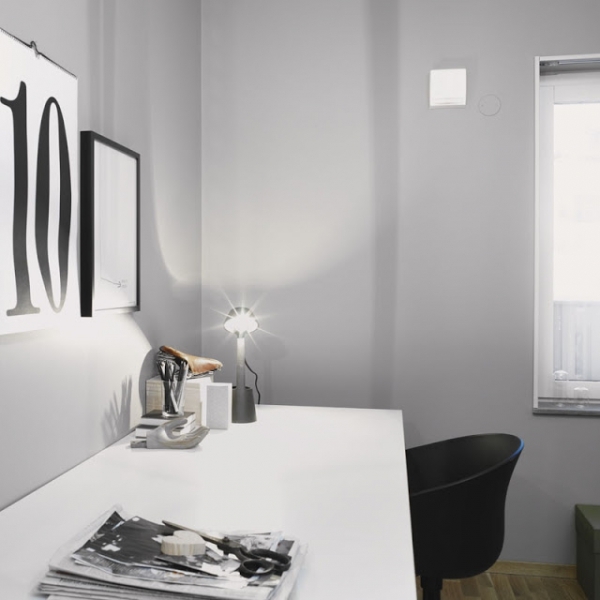 Two grey tables provide a spot for two grey lamps, and posters are placed on the wall, bringing a bit more personality to the room. 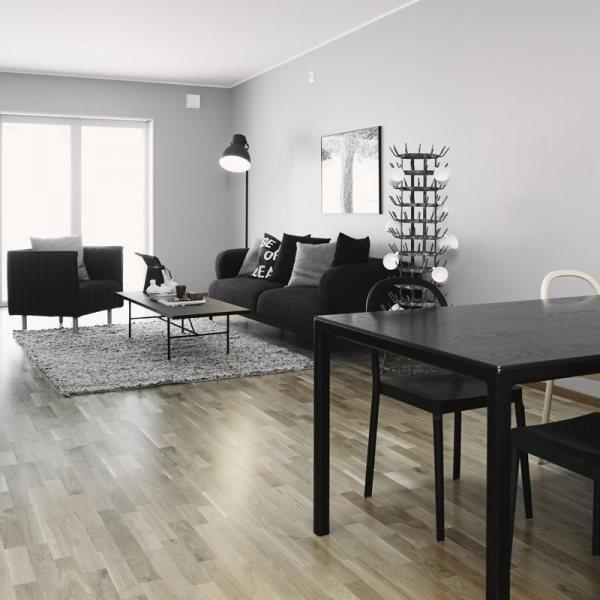 A dark grey area rug sits on the hardwoods adding variety to the grey color scheme. Next to the patio door, which allows natural light into the room and provides easy outdoor access, a black chair sits: simple and beautiful. The bathroom is just fantastic. 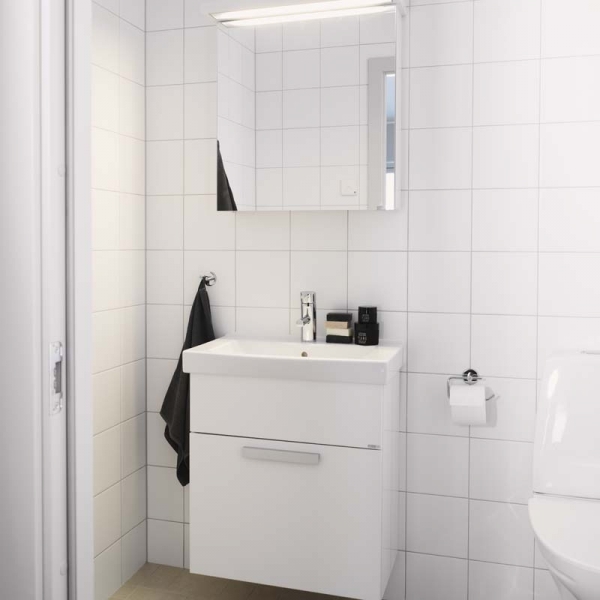 White tile fills the wall, and a square mirror sits above a white sleek sink. We are in love with this mirror, the design is impeccably clean. What do you think? 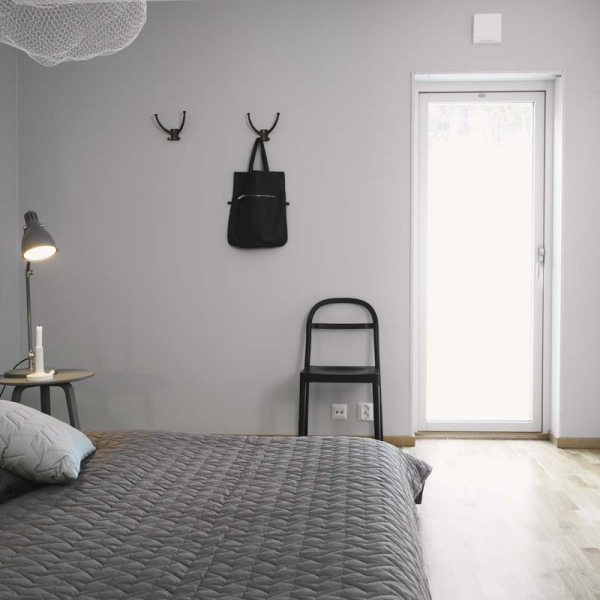 Do you like this grey color scheme?